The Korean box office has caught fire in high summer as Roaring Currents, a new period blockbuster, has become the second film in only eight days to break the opening day admissions record, which had previously stood since the summer of 2011 when it was set by Transformers 3. With a stellar 683,185 admissions (USD 4.76 million), the story of the famed Battle of Myeongryang handily topped last week’s short-lived record of 551,848 admissions (USD 4.09 million), set by Kundo: Age of the Rampant. 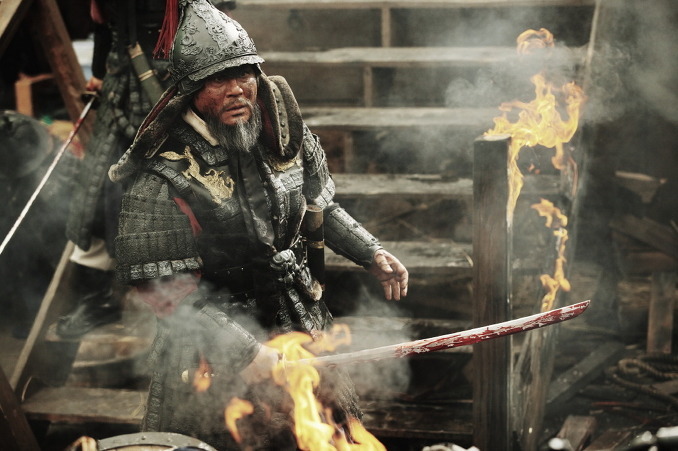 Directed by KIM Han-min, who previously found success in the period action genre with War of the Arrows (2011), Roaring Currents stars CHOI Min-sik as the legendary Admiral Yi Sun-shin who led his fleet of 13 ships to victory in the straights of Myeongryang against a Japanese imperial fleet of over 330 vessels. Starring opposite CHOI as the Japanese Admiral Kurushima is RYU Seung-ryong. With a reported KRW 15 billion (USD 14.62 million) budget and a famous historical tale to rely on, Roaring Currents, from local powerhouse CJ Entertainment, was one of this summer’s most anticipated releases. The film accounted for 61.6% of admissions, pushing yesterday’s total number of spectators to 1.1 million, marking a new record for a non-holiday Wednesday. Meanwhile, Kundo: Age of the Rampant came in second place with 177,782 viewers. The film has brought in 3.82 million admissions (USD 28.82 million) in eight days. Along with last week’s Kundo: Age of the Rampant (from Showbox) and next week’s The Pirates (from Lotte Entertainment), Roaring Currents is one of three back-to-back period blockbusters being released this summer.